One of the reasons I delayed going to climb the Marmolada for so long was that the approach to the hut for the overnight stay is via the Fiaccone Lift. I have travelled on a number of very rickety and ancient lifts which have since been condemned but this one looked the most fragile and insubstantial of them all, A single person has space to stand in a small cage with open space all around. Finally last summer I did it, and it was fine (of course) You can walk instead of using this lift, but when you are carrying all your stuff for a couple of days, and hoping to arise at 3am to walk up the mountain, this is not ideal. 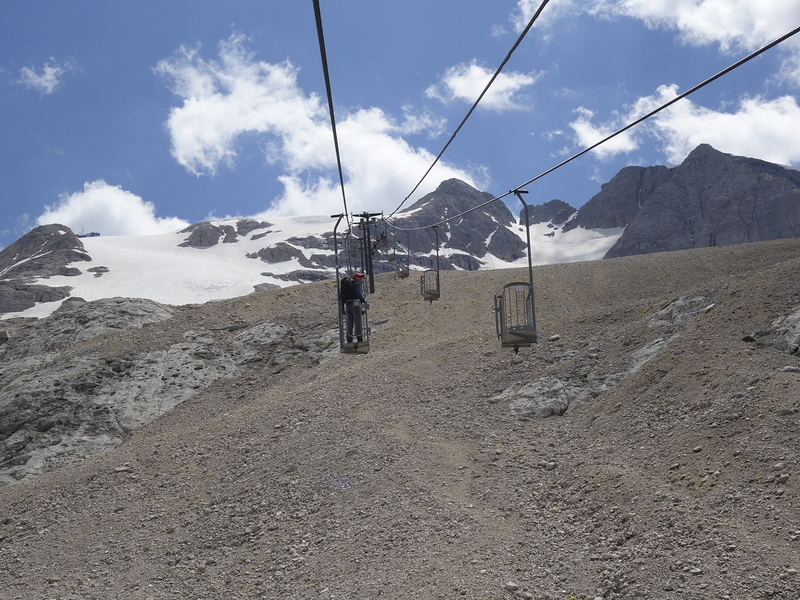 This entry was posted in FUN, ITALY and tagged alta badia, CLIMBING, Dolomites, Fiaccone Lift, hiking, italy, mountain, MOUNTAINEERING, travel, tyrol. Bookmark the permalink. Wow! You are braver than I am!